In about 1915, we were told, four years before women got the vote, a band of suffragettes whom the L.A. Times dubbed rabble-rousers used to meet in a house in South Pasadena. In 2015 we went to hear another band do a concert in the garden of that house, not knowing this story but always keen to hear I See Hawks in L.A. The name comes from one of their first songs, which with typical originality, quirkiness, and sly humor imagines the predatory birds hovering over our city as they sense that the “big one” is imminent. 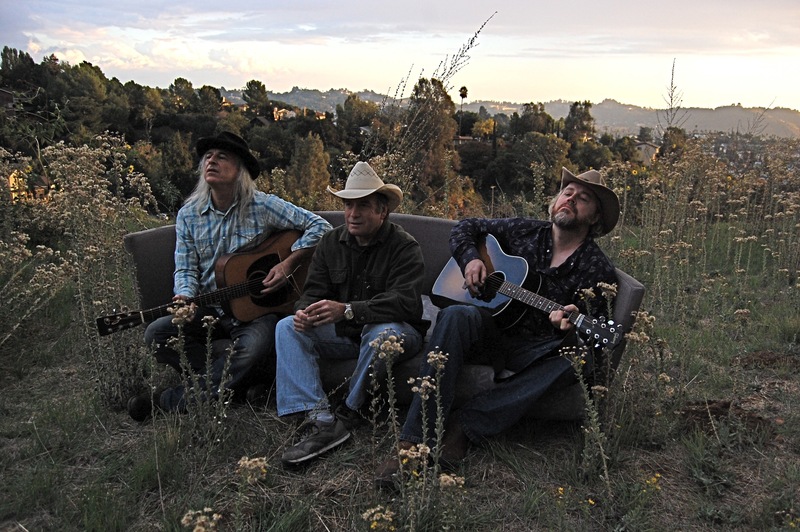 The Hawks are a country trio, but theirs is “California country,” not country as played by men in big hats. The guitar expertise comes from Paul Lacques, he with the very long grey hair. The vocals come from Rob Weller, who is a dead ringer for one of my faculty colleagues; I often do a double take on the latter. The other indispensable Paul, Paul Marshall, plays bass. Rob is younger than the others. My favorite Hawks song is actually called “California Country.” It tells the story of someone’s lifetime journey from green fields to urban sprawl, but the singer is still rejoicing to be “living in California country.” Rob explained one time that Paul Lacques had to revise the dates in the song so that it became plausible on Rob’s lips. The song goes on to recall getting stuck on the freeway in Glendale near where we live, on the way to trying to see the annual meteor shower. Lo and behold, that shower is to happen tonight, and Kathleen and I will look for it, but we’ll avoid the Angeles Crest. Through the music of the opening acts at this particular show, I realized more clearly two things about the Hawks. The first opening act was a teenage singer-songwriter whose songs were confessional and musically loose, though therefore not very hummable. The Hawks tell stories but their songs are hummable, singalongable. Indeed, their songs are indulgent or wasteful in the sense that they throw in extra melodies and don’t develop them. They know another will come along in a minute. The other two opening acts were striking in a different way. In both cases the bands were playing songs that some players had never played before (and without music charts). How could they do that? Because most country-type music (like most pop music and much jazz and rock) utilizes one of a number of standard formats in terms of the number of bars and the chord sequence. So though the tune may be unfamiliar, you can know where the song is going structurally and musically, and you can join in even if you’ve never played it before. You couldn’t do that with many Hawks songs. They’re not illogical or disorganized. But you commonly can’t predict where they might be going. Yet when they get to the end, they have been somewhere, lyrically and musically. It’s a mark of a musically great band, I’d say.